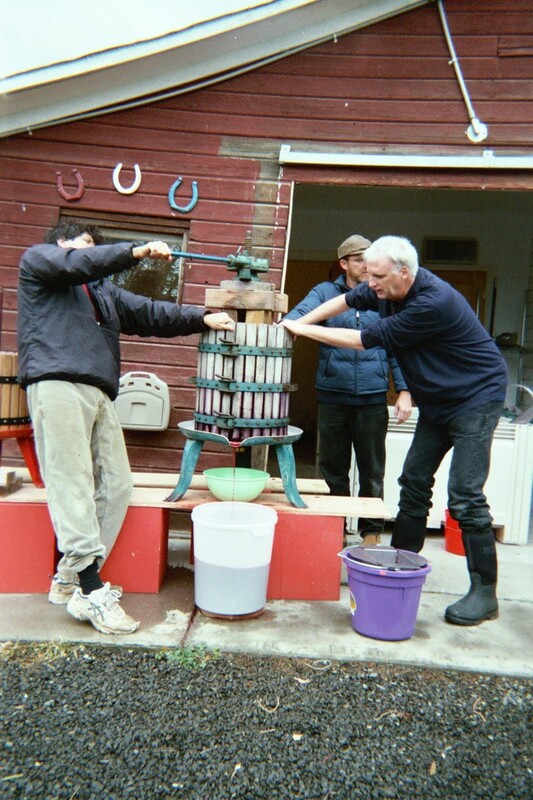 The pressing of our wines has begun. 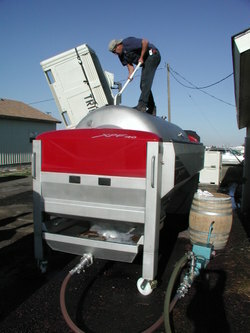 This is very exciting because we can move the wine out of the fermenting bins and into the barrels. 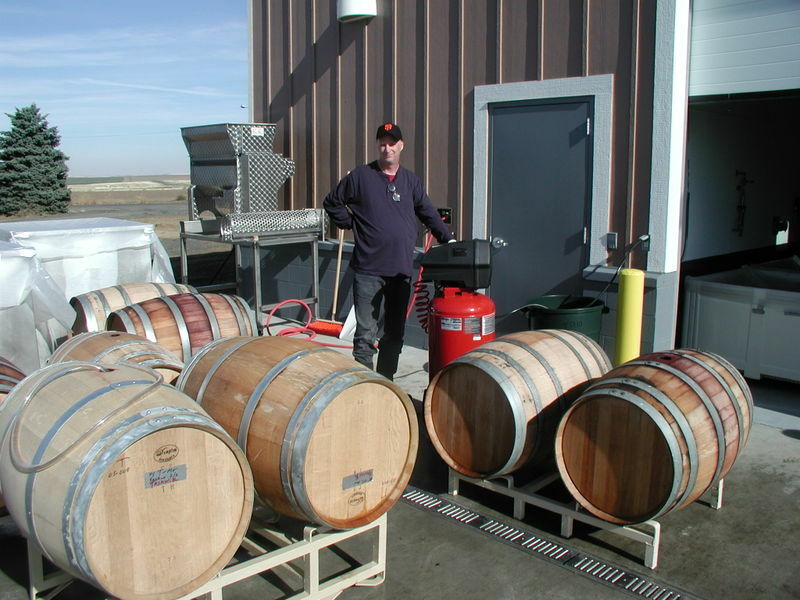 To be honest, looking at our barreled wine makes me feel a lot more like a winemaker. 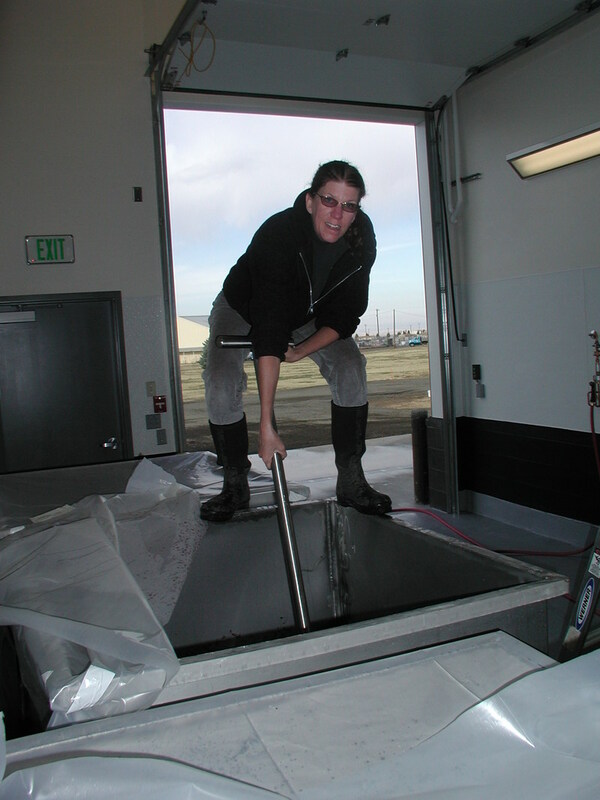 Looking at a fermenting bin makes me think of a car wash - it's a big steel thing that has to get scrubbed out! 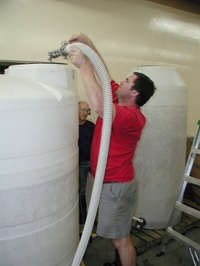 Barrels get their final rinse and are leak tested. In general, lots of prep goes into this part of the operation. We have to make do with the equipment we have (which is just fine for our start up needs) but getting the must and wine into the press requires a dump with the fork lift. Don't spill a single drop, Tim! The kind of press we use is a horizontal pneumatic press. It consists of a long barrel with an inflatable bladder running lengthwise along the central shaft. 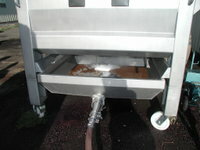 The must is dumped in and the "free-run" juice collects in the bottom of the pan below. I've heard that some some winemakers toss this or keep it completely separate for later use in blending. 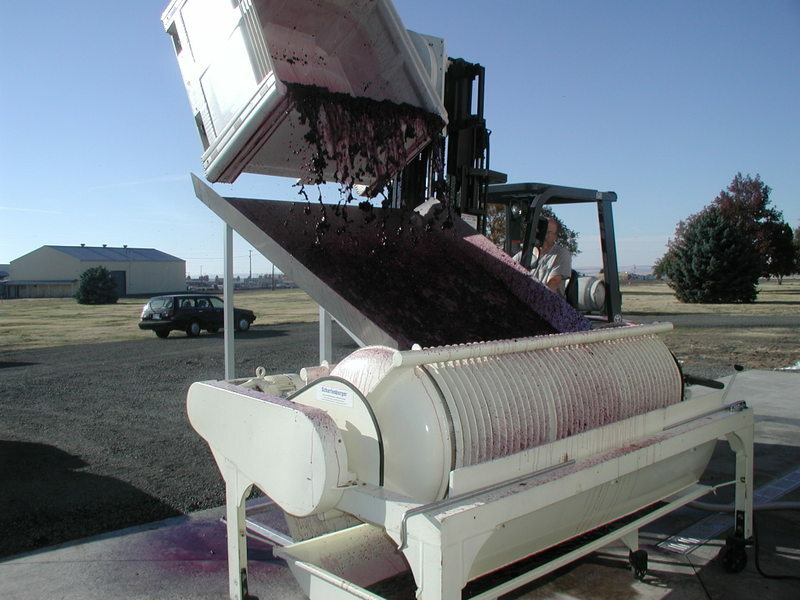 Free run is not of lesser quality by any means, it's just less compacted with the tannins and other complexities that are pressed out of the skins (and seeds to a lesser extent). The barrel is closed up, rotated and small increments of pressure are applied to the must via the inflating bladder. This process can take quite a bit of time (hour or so?) depending on what kind of flavours we decide to extract from the pressing. We continue right up until the point we are tasting "bitter". The bitterness will be coming from stems and seeds and any amount of this is undesirable in the kind of wines we are making. Where in the World is Dee? OK - if you can figure this out then you know way more about winemaking than I ever thought I did! 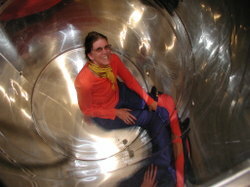 I'm sitting inside one of our stainless steel tanks, which we'll be filling with pressed wine as of tomorrow. It's quite lovely in there - all shiny and gleaming with promise. This one has a manway at the bottom. Well, somebody has to climb in there and clean it! Life around the winery continues at a frenetic pace. We crush our last lot tomorrow and then it's just a matter of moving all this juice around until it gets positioned into the appropriate place for racking and aging. Today we had to decide which barrels get which wine. There's so many options. French, American, Hungarian, new, one year, two year old or neutral. It's a puzzle. I think it only begins to make sense year over year when, over time, you can actually gage and evaluate the decisions you have made. To be a good winemaker is to remember what you did. To be a great winemaker is to remember why you did it. 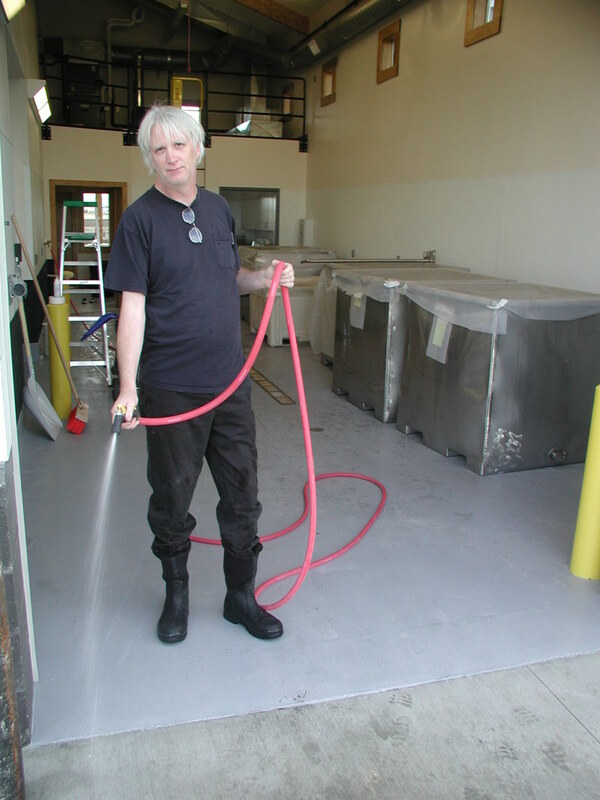 As for now, we go on our best judgment and knowledge amassed from experience and working in other wineries. And gut. And nerve. 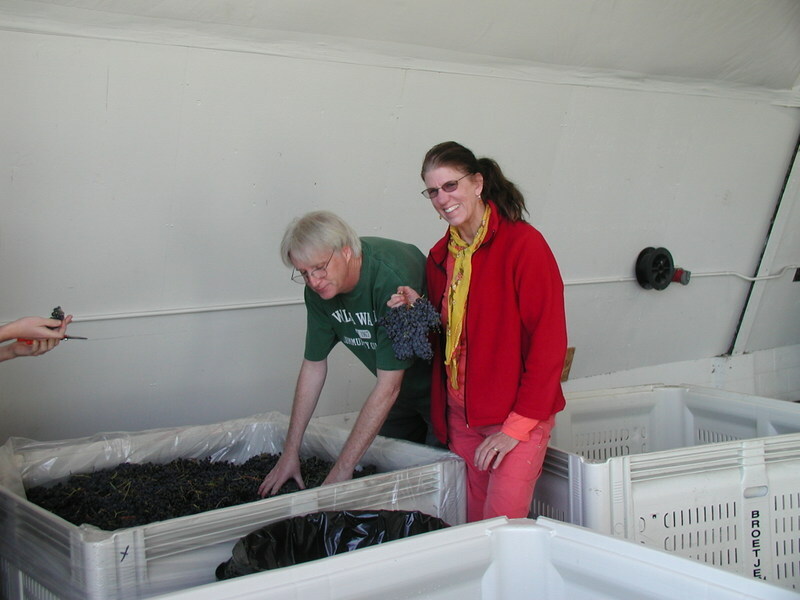 It's easy to be attracted to the wine making scene. 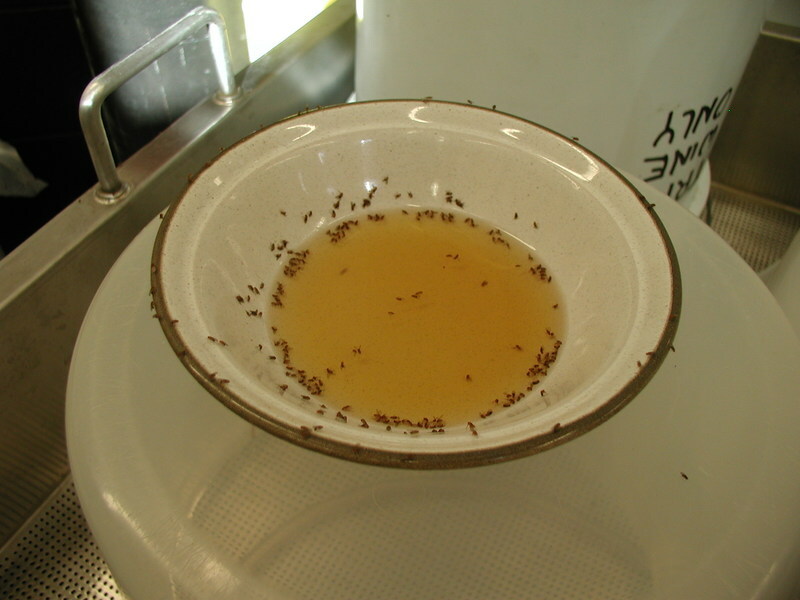 For now, our most frequent visitors are fruit flys. Sadly, they are everywhere. 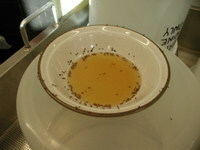 We tried placing fresh basil around as a deterrent (someone mentioned this is a trick) but it seems that Steve's recipe of a bowl of vinegar and sugar is zapping these suckers. Au revoir mon petit fruit vole! There's a second meaning to crush that I am now beginning to understand. You can't know the second meaning until you are actually in the thick of it. 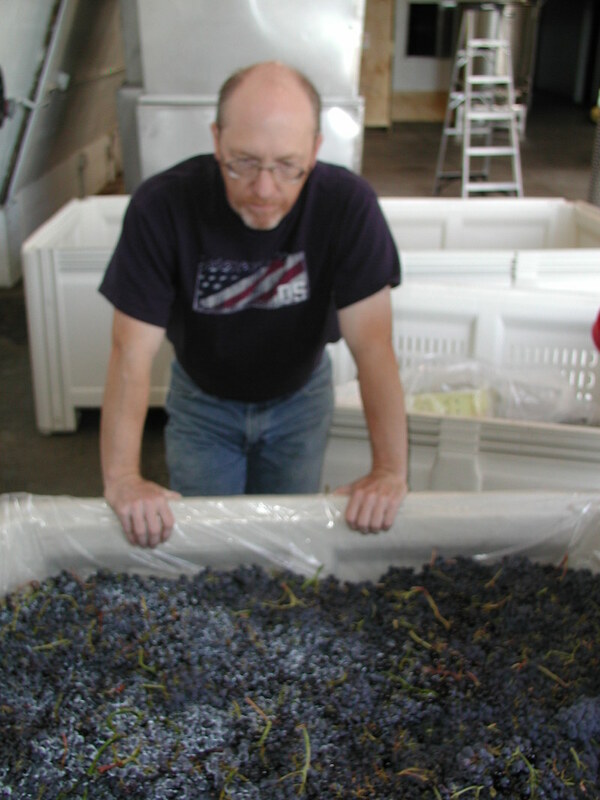 If you're on the outside looking in - it appears one way; get grapes, process, ferment. But when it's you doing the crushing it seems as if all things around you are also getting crushed. Every thing is smashing down and compressing. The time you thought you had to get something done evaporates. A task you figured would take 4 hours ends up eating up the whole day and creating 6 new items on the to-do list. The kids you need to feed and read to are running wild outside the winery. There are 12 messages on the machine at home and a kids' birthday party to plan (OK all you kids---take your shoes off and crush these grapes). This is just the nature of things. But, it's like we're in some kind of giant trash compactor and the weight of what lies ahead is coming head on. Now, don't get me wrong. I'm rather enthralled by it all....But crush is a time when everything revolves around the fruit - and we are merely here to serve. 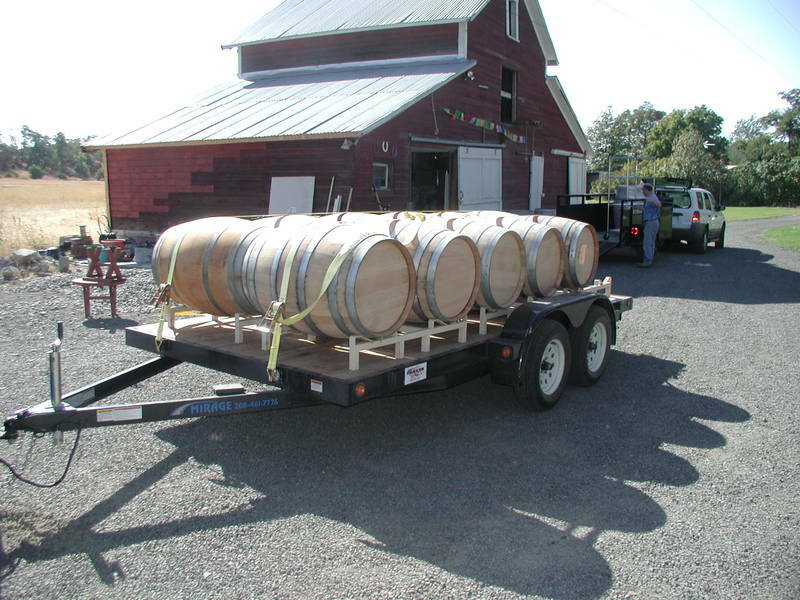 Wine barrels are the primary means of storing and aging red wines and some white varietals. Once full, they're very heavy and must be moved with fork lift or pallet jack. Mostly they don't get moved around. In this photo, we're moving our empty wine barrels to the new winery (that's our barn in the background.) 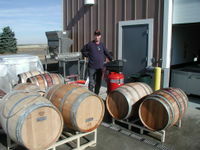 They are placed in our barrel room and staged there until it's time to rack off the wine or bottle. They remind me of huge seal lions lolling around the rocks. The wine inside the barrel is living and changing over time - and the characteristics of the oak make an impact on the final outcome of flavor and profile. You have to appreciate how a barrel is made. It's done completely by hand. French oak is preferred although excellent barrels are made from American or Hungarian oak as well. There are subtle differences of course, and wine makers spend lots of time and energy to zero in on these differences in search of the 'best' cooperage to match their preference for the particular wine they're making. But barrel making is an art form. If you ever get a chance to see a cooper in action you'll gain a new perspective in what 'hand crafted' really means. 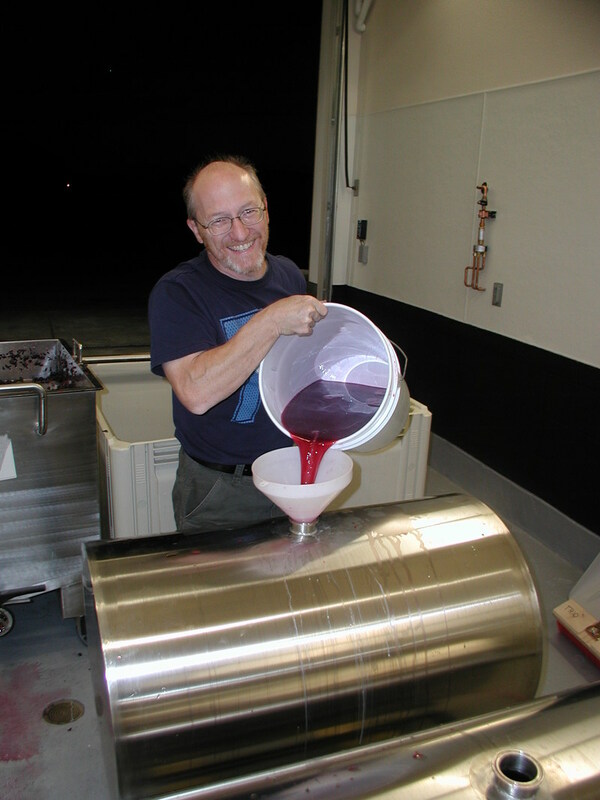 Yesterday we worked on making our Rose of Sangiovese. We have chosen a method that allows the crushed red grape skins a decent amount of contact with the juice. This is how the Rose will achieve it's color. 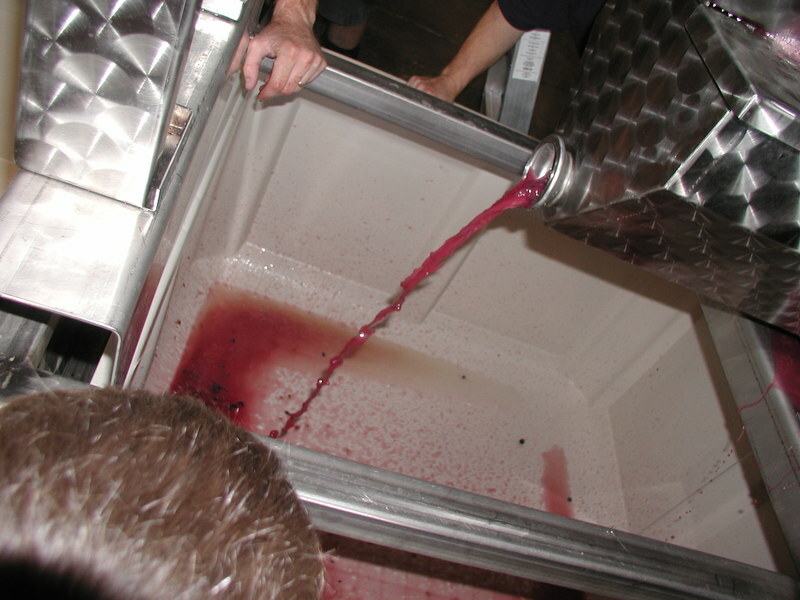 Basically the juice is what we call the 'free run', it hasn't been machine pressed out of the grape. This is the juice that is pressed from the the crushed berry naturally from it's own weight after being crushed and destemmed. 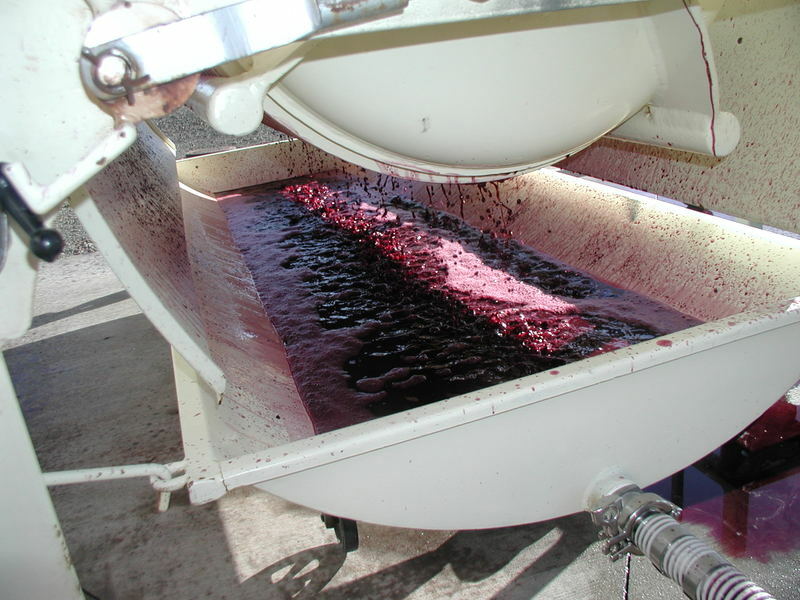 The more time the juice spends in contact with the grape skins the darker it gets. 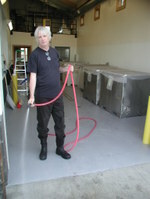 Here Tim is pouring the strained juice into the stainless steel barrels that we will ferment the Rose in. At this point it gets fermented like at white wine, at cooler temperatures. The color is gorgeous. I'm calling it pomegranate and I would like to paint the walls of my house this color! Or maybe die my hair this shade. I think it will make a beautiful, fresh and fruity drinking wine, with all the lovely characteristics of Sangiovese. This can be enjoyed in the spring! The Riesling press is underway. I mentioned a few blogs ago about the whole cluster press method. That's what you see in this series of pics I am including in this post. Roman (who works for Caleb Foster at Buty Winery) is dumping our grapes directly into Caleb's press....which we should mention is sort of like the Rolls Royce of grape presses. 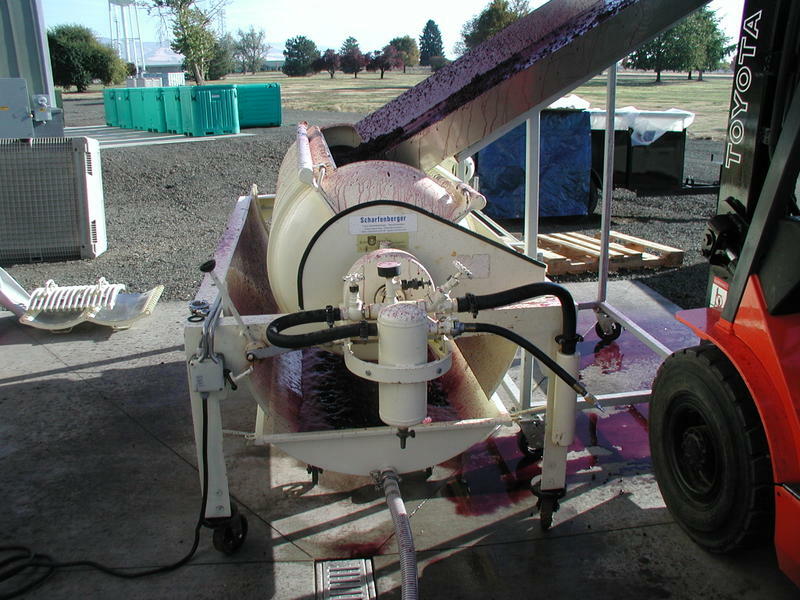 It's especially designed for pressing white varietals, and has variable cycles so that very little churn is forced upon the grapes. You can also put a heck a lot of grapes in there at once. It's a softer, nicer way to get the juice out of the grapes. Fancy, eh? The grapes are very gently pressed and juice is turned out into this tray where it is gently pumped into a portable tank that we'll move to our location. There's CO2 floating around there in the form of dry ice to keep everything cool. As I have said a million times, I think wine making is mostly about logistics and moving big quantities of liquid around. Oh, and yeah, it's about drinking the wine too! We tasted the juice - it's very lovely, lots of acid, not too sweet. 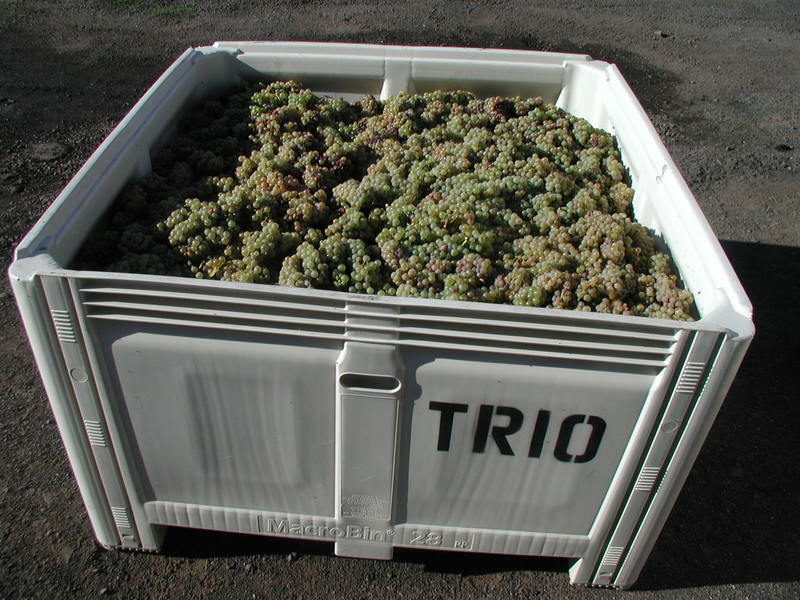 Just the way you want a fresh and fruity Riesling to start out....The idea is to get the fruit right and then do as little as possible - in other words, just don't mess it up! Posted by Denise - email me! Hooray!, the door is on the new winery. This is a step in the right direction! 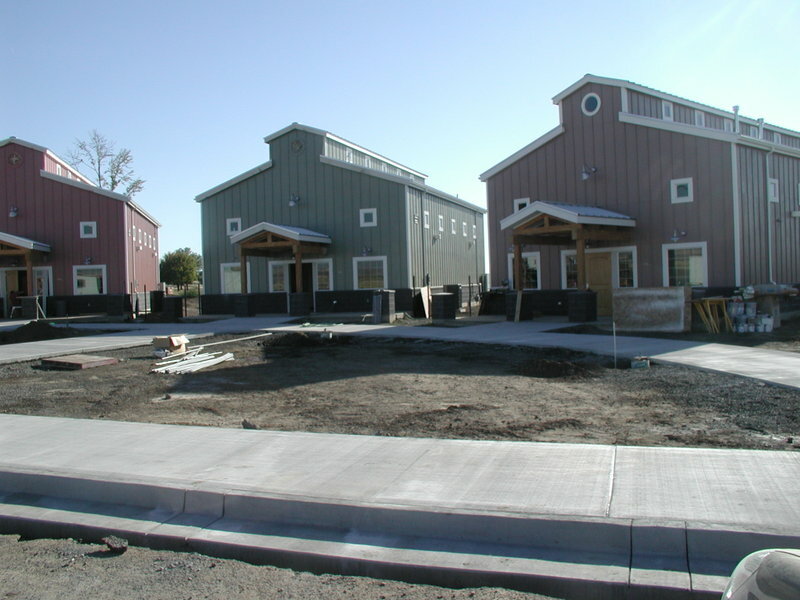 Now we can actually get our winery license and, if all goes well, we'll be in there on Saturday. Here's a peek at the site still under construction. 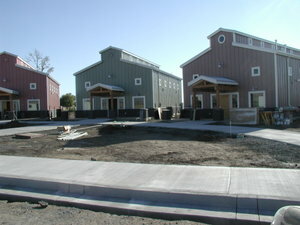 We're the winery on the far right...the color is offcially called "mocha". Now, how does THAT blend with wine??? 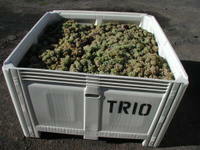 Start of a new week with lots of tasks to do around Trio Vintners. We have tossed some yeast into the Sangio so the first fermentation process has begun. We'll "maybe" add some acid later. It's a wait and see. Mostly we want to do as little to the grape must now as possible. Our Sangiovese fruit came from Tasawik Vineyards which is on a beautiful site right above the Snake River and very close to where it meets up with the Columbia. It's an ideal spot of grape growing. This also happens to be where Brotje Orchard is...one of the largest apple farms in the world I believe. Here we are picking though and sorting out the grapes. No sorting tabl e yet! This job was done by hand with help from Steve's niece Hannah and her 'roommate' Kevin. 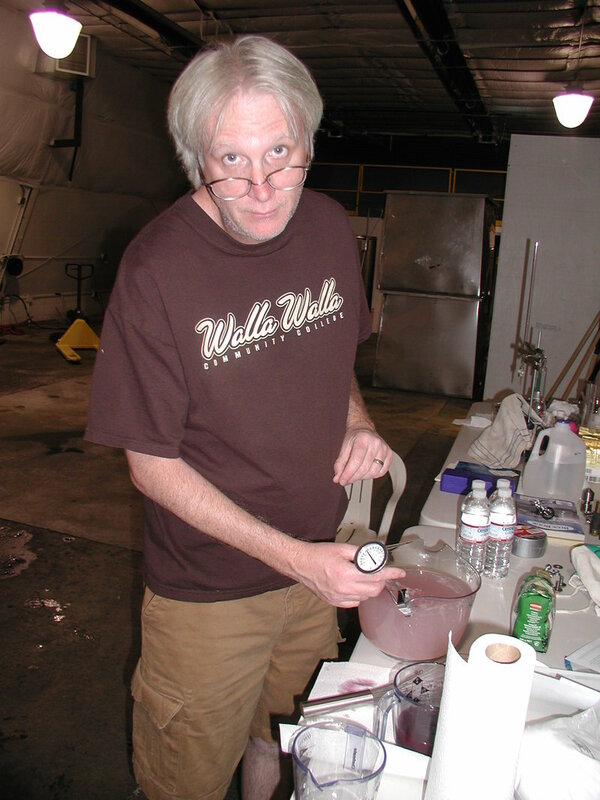 Steve Is hydrating the yeast here. Very sophisticated lab work. His nursing skills are really kicking in as you can see. Oh My gosh! It's grape juice! Hey, where's the wine?????? Here's our partner - Tim Boushey. Thank god he knows what he's doing!